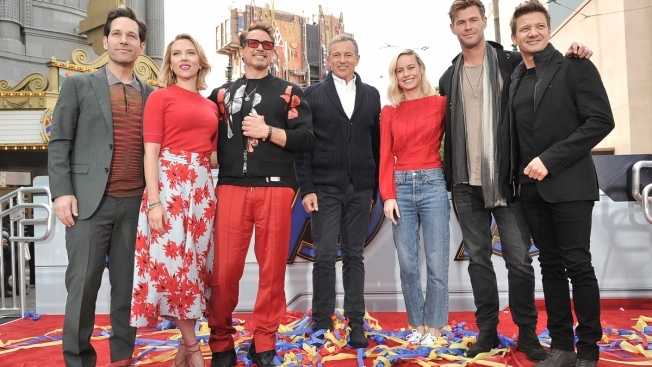 Paul Rudd, from left, Scarlett Johansson, Robert Downey Jr., Robert Iger, Brie Larson, Chris Hemsworth and Jeremy Renner attend Avengers: Endgame stars and Disney announce Universe Unites Charity at Disney California Adventure Park on Friday, April 5, 2019, in Anaheim, Calif.
Marvel fans are being warned to stay away from social media after leaked footage from the upcoming “Avengers: Endgame” was found circulating online. Walt Disney has kept the film shrouded in so much secrecy that even journalists and critics weren’t permitted to see the film ahead of its premiere. Those who have viewed the clip have called it “spoiler heavy.” Screen shots, gifs, short clips, and detailed posts about what occurred during the clip are already surfacing on Twitter and Reddit. Disney did not immediately respond to CNBC’s request for comment. Although a leak like this likely won’t deter fans from going to see the film on its opening weekend, it is a deflating moment for Disney after it has worked so hard to prevent any information about the film getting out early. “Endgame,” the 22nd film in the Marvel Cinematic Universe, is expected to finally give some resolution to the events of “Infinity War,” in which half the heroes disappeared into dust. It could also serve as the last film for several of Marvel’s most iconic characters. It’s also expected to top a number of box office records and make a run for one of the highest grossing film slots. In its first week of presale tickets, “Endgame” sold nearly twice as many tickets on Atom Tickets as “Aquaman,” “Star Wars: The Last Jedi,” “Avengers: Infinity War,” and “Captain Marvel” combined.